Dedicated medical malpractice attorneys serving Washington, D.C.
Surgical procedures require not only a team of qualified medical professionals, but also a host of tools and devices to ensure that the procedures go smoothly. In some cases, however, negligent surgical teams actually leave these tools and foreign objects inside of the patient’s body, which can lead to serious consequences. Paulson & Nace, PLLC, handles catastrophic surgical errors like these for victims throughout Washington, D.C.. We understand exactly what kinds of health consequences you might face, and we know how to build winning strategies for victims of medical malpractice. If a negligent surgical team left a foreign object inside of you or a family member during a procedure, we may be able to help. Hospitals and medical centers provide checklists to their staff and doctors to ensure that such mistakes will not occur, and require that surgical teams count how many tools or devices they are using before and after the surgery. Yet these surgical errors occur approximately once every 5,500 surgeries. With slightly more than 51 million procedures per year, that is a much higher number than you might first think. The number one risk to patients who surgical teams have left a tool or device inside of their body after surgery is infection. Your body will attempt to fight off the “invading” object on its own – an act that can make you very sick. If the object inside of you was not 100% sterile, you could easily become infected with whatever bacteria or debris were on the object. Patients may also suffer organ damage, internal bleeding or organ perforation, if the object inside of them moves from its spot or pushes into the organs, veins or arteries. This mistake will necessitate another surgery, which puts you at additional risk because of your body’s currently compromised state. If the object is not located and removed quickly, you or your loved one could die. There is never an excuse for leaving a sponge or a surgical tool inside of a patient. At Paulson & Nace, we protect your rights as a victim when a healthcare provider commits an act of gross negligence such as this. We have secured millions of dollars for our medical malpractice clients in verdicts and in settlements. We champion your rights and your family’s future every step of the way. 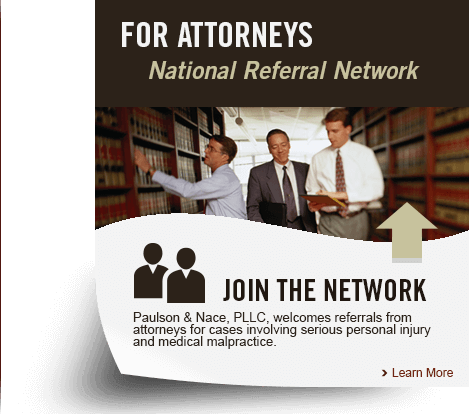 Paulson & Nace, PLLC, has the skills and the experience you want on your side when a surgical team commits negligence. If you or your family member was forced to endure another surgery or procedure because a foreign object was left inside of your body, please call 202-930-0292 or fill out our contact form for more information.